Framed within basic marketing principles, Marketing for Tourism, Hospitality & Events highlights the global shift in tourism demographics today, placing a particular emphasis on the role of digital technology and its impact on travel products and services. Covering developments across a broad range of topics such as contemporary tourism marketing, understanding today's consumer, and the importance of public relations and personal selling, key industry changes are captured throughout the text. 'Lessons from a Marketing Guru' feature personal insights from real world practitioners, and 'Digital Spotlights' highlight the ways in which social media and the Internet have transformed tourism, hospitality and events the world over. The book is complemented by a companion website featuring a range of tools and resources for lecturers and students, including PowerPoint slides, an instructor manual, a test bank of multiple choice questions and author-curated video links to make the examples in each chapter come to life. 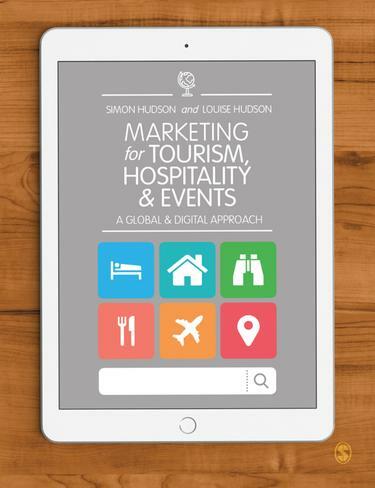 Ideal for undergraduate and postgraduate students looking for an introductory text to marketing for tourism, hospitality and events.